原爆の日から70年, CNNj が伝えたこと - dutcheez’s Fun with English! The textbooks taught me for example, growing up in the US, that the bombing of Hiroshima and a few days later of Nagasaki, that they were basically necessary evils, that the US had to slaughter hundreds of thousands of civilians to bring about a swifter end of WWII, i.e., to basically save lives. ... but the discomfort that the teenagers felt that I might feel here, also appears to be shared by US government over the years. 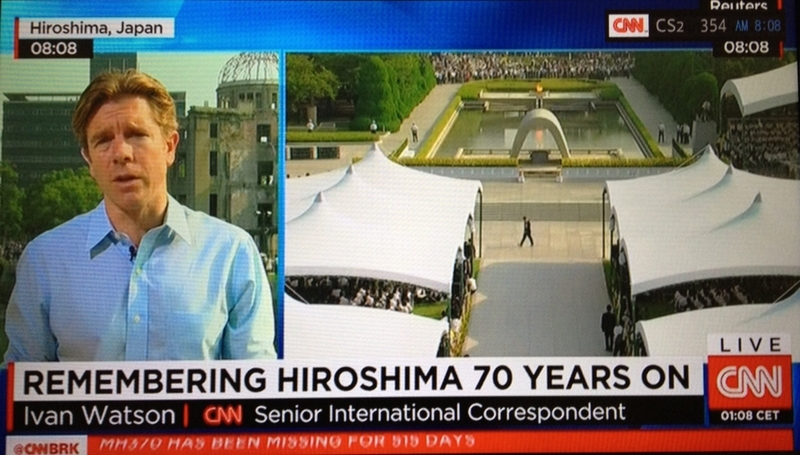 It took 65 years for US ambassador to come to the annual commemoration ceremonies here in Hiroshima just 5 years ago, and this year the very first time the US government sent an undersecretary of state also attend the ceremony here which also suggests that the US government has had some discomfort observing this grim anniversary. Let's go back to the original sort that the situation that Japan finds itself in after its postwar pacifist constitutional posture now, some seeking change to that. North Korea, not far away, a nuclear armed neighbor that has fired missiles over Japan, China is resurgent with the world’s second largest economy but also a growing military and there are territorial disputes in the South China Sea; direct territorial disputes involving Japan and so some Japanese are saying these days it’s not enough to just say world peace; we have to be more pragmatic and recognized that there are new threats in the world and perhaps we cannot purely rely on our US ally for military protection against these potential threats. also repeated the call for nuclear non-proliferation saying never again, we must never see a disaster like the one 70 years ago, when the atomic bomb flash went off in the sky, exactly 70 years ago.